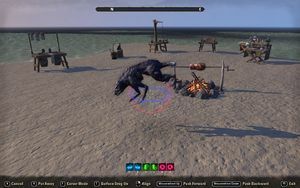 The Housing Editor is a feature which allows you to place and decorate furnishings and other items inside Player Houses, and purchase new furnishings from the Crown Store. Many items can also be crafted or purchased from Furnishers, and then placed in houses using the Editor. [Z] Go to Entrance - instantly teleports you to the house's entrance, useful if you get yourself trapped in the house. [R] Put Away - puts the item in your inventory so you can move it somewhere else, useful for moving an item to another house, or moving an item from one room to another, or for selling or trading the item to another player. [T] Surface Drag Off - By default, items will be placed against whatever solid surface you are pointing at. By turning this off, you are able to place item in mid-air or embedded with other items, below the ground, etc. When this mode is turned off, you are given two additional options to push or pull the item using your mouse wheel. [RMB] Align - Attempts to align the item against the surface you're pointing at, useful for placing items against a wall or ceiling. If the item does not behave as you expect when doing this, try putting the item away and re-placing it to reset its rotation. You can also rotate selected items using the 1-6 keys. The icons and the colored rings around the item will give you an indication of the direction of rotation. Be careful about rotating on the green and red axes as it is possible to get an item into gimbal lock when near 90 degrees off its default rotation (meaning it won't stay at certain rotations). If you're having trouble getting an item to stay in its set rotation, try rotating it 180 degrees around and approach it from the other direction. The Item Browser, accessed (by default) by pressing R while in edit mode, will display a House Information window, along with an inventory screen with 4 tabs. The name and zone are displayed at the top (note that renaming your house in the Collections menu is not reflected here, only the default name will be shown.) Below that are the counts for the various types of furnishings you have, as well as the maximums for the size of your house (which also depends on whether you have an ESO+ subscription). Special Furnishings - Includes visual effects furnishings, which are limited to improve performance. (There are few available, among them: Fogs of the Hag Fen and Mists of the Hag Fen. Collectible Furnishings - Includes all static Collectibles, which mainly means Undaunted Trophies. Special Collectibles - Includes all animated Collectibles, such as Mounts, Non-Combat Pets, and Assistants. Next is an indicator as to whether this is your Primary Residence, which can be changed in settings, and finally a Population counter, which tells you how many players (including yourself) are present in the house, and what the cap is for that as well. Place - lets you select an item from your inventory. You can browse the categories and sub-categories on the right, or type part of the item name in the "Filter By" field if you're looking for something specific. Purchase - lets you purchase new items from the Crown Store. There is a similar list of categories and sub-categories here. Before spending crowns, be aware that most of the items available here can also be acquired by other means. Retrieve - lets you pick up items that have already been placed. You again have the categories and sub-categories, but in addition, you will see that items here are sorted based on distance, so the closest items will be at the top, with an arrow indicating the direction. This can be very handy if you lose an item inside a wall or something. Settings - This screen lets you manage your permissions for visitors to your house. In the General section you can set the house to be your Primary Residence (necessary to allow other players to visit when you are not at home) and also set the default visitor access. "No Access" means other players cannot enter your home at all. "Visitor" allows them to enter the house but not move items (though they can still do things like turning lights on and off). "Decorator" allows other players to move items around in your house. They cannot remove or add items, though they may place them where they are difficult to find without the "Retrieve" menu, so you should only grant this access to people you generally trust. (It is highly advised to keep the default at "No Access" and only allow specific friends or guilds to have access.) The other sections let you add or ban specific players or entire guilds. Once you have these set up for one house, you can use "Load Permissions" to apply the same settings to your other houses. This page was last modified on 10 April 2019, at 04:52.